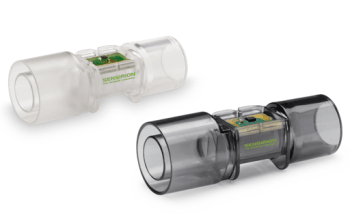 Sensirion’s SFM3200 mass flow meter is ideally suited for inspiratory flow measurements. Furthermore, an autoclavable/washable model is available (SFM3200-AW), which can endure autoclave procedures, making it reusable and suitable for expiratory flow measurements. The SFM3200 mass flow meter is defined by its broad dynamic measurement range of up to 250 SLM, in addition to its measurement accuracy at low flows. The flow channel’s special design results in a very low-pressure drop via the flow body of the sensor, which renders it very suitable for medical ventilation and other respiratory applications. The thermal sensor element guarantees bidirectional measurement mode and rapid signal processing time, with the signal being internally linearized and temperature compensated. 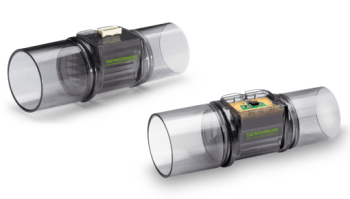 The SFM3200 sensor’s exceptional performance is based on Sensirion’s patented CMOSens® Technology. The technology enables the addition of the sensor element and the analysis electronics on a single, minute CMOS silicon chip. The result is an extremely steady and precise system for challenging and cost-sensitive applications.